According to the page, during that time $2,907 was raised of a $4,250 goal with the intention of paying for the Gis that were collected to be sent to Brazil, specifically, Drive In Jiu Jitsu which was highlighted in Christian Graugarts blog here: http://www.bjjglobetrotter.com/?p=2271 this is likely to not include a non-disclosed amount that may have been collected in person or through other means. Many BJJ companies including MMAstop.com, Meerkatsu, SubCulture USA, Gawakoto, Scramble, Ronin Brand , MMAoutlet.com and MAS contributed to “Perks” that people could buy and know the money was going to the cause. Several Chicago BJJ instructors also lended their time and resources to the project, Andre “Maneco” Leite, Mark Vives, Jeff Serafin, Misho Ceko, Adem Redzovic and Jay Valko. He makes those same claims in an interview he did with Sally Arsenault for the online magazine BreakingMuscle.com (in August of 2013) and more recently even GiCritic (March 2014) mentions it. A large group of the BJJ community came together to support this great cause. Almost 2 years have passed since the indiegogo campaign ended and I hadn’t seen a single picture, post or article done on the success of the campaign and the kids wearing any of their “new” gis. This, based on Brendan Huffords marketing prowess, left me concerned. 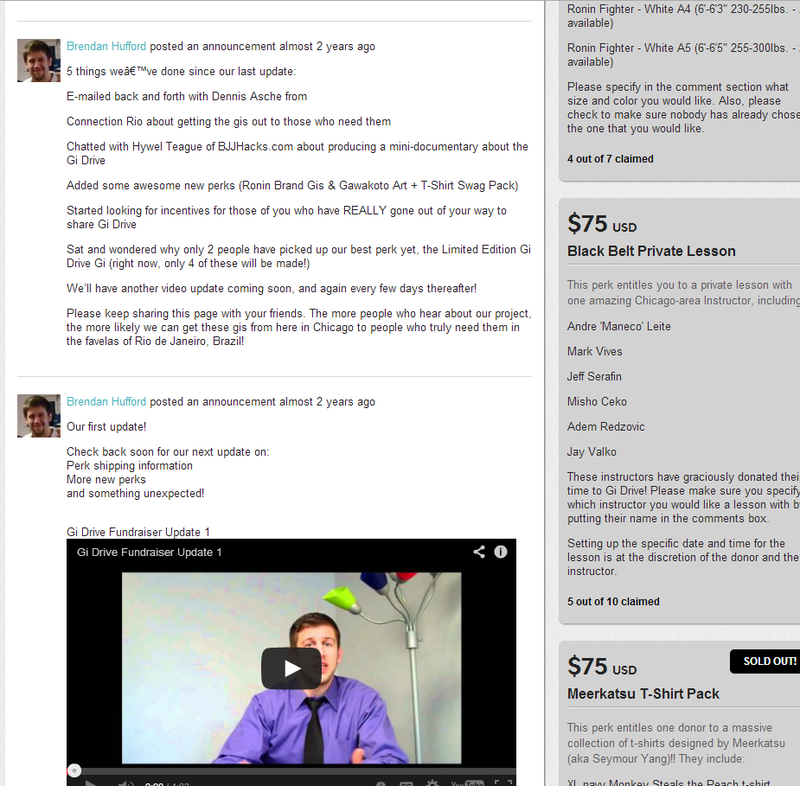 Brendan surely knows how to market things he is doing, so why not post anything in regards to Drive In Jiu Jitsu. 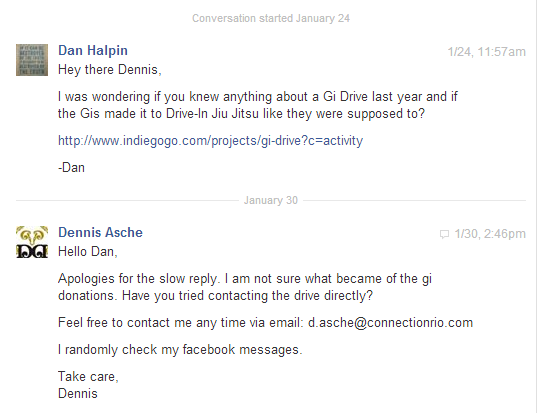 So I contacted Dennis Asche who emailed me saying he had no knowledge of what became of the Gi Drive and surely didn’t assist in them arriving in Brazil, so if they did arrive, they came from another avenue. I emailed him back asking if he knew how to contact Paulo at Drive In but have yet to receive a response. I then contacted Christian Graugart on his facebook page asking if he knew how to get a hold of Paulo and he did, which was via a Facebook page which I had been unable to find previously. So, almost two years later there is a large amount of Gis that were donated and a large amount of money donated to a cause that was unaware of the campaign even going on who never received a single Gi, nor a single cent. I know a lot of the donated Gis were adult gis and Brendan claims were sent to a project in California (I am unaware of to where exactly though). Regardless, it’s a disgusting thing to promote your brand as going charity work you DON’T ACTUALLY DO. I’m sure he’s just holding onto the money in his bank account or paypal account for a rainy day to randomly decide to finally send it to them. That amount of money could easily outfit an entire academy for a very long time with brand new gis if the money alone had been used to order Gis from a factory or a generous company in Brazil who would discount a bulk order. The fact that he has never supported Drive-in has not stopped Brendan Hufford from allowing people to say he does in online articles about his company. Which at the very least is dishonest and lacks integrity. If you were a part of the Gi Drive, I’m pretty sure you’d like to know what happened to everything. At the very least, maybe this article will actually help get that money to where it was supposed to go by forcing Brendan to act. 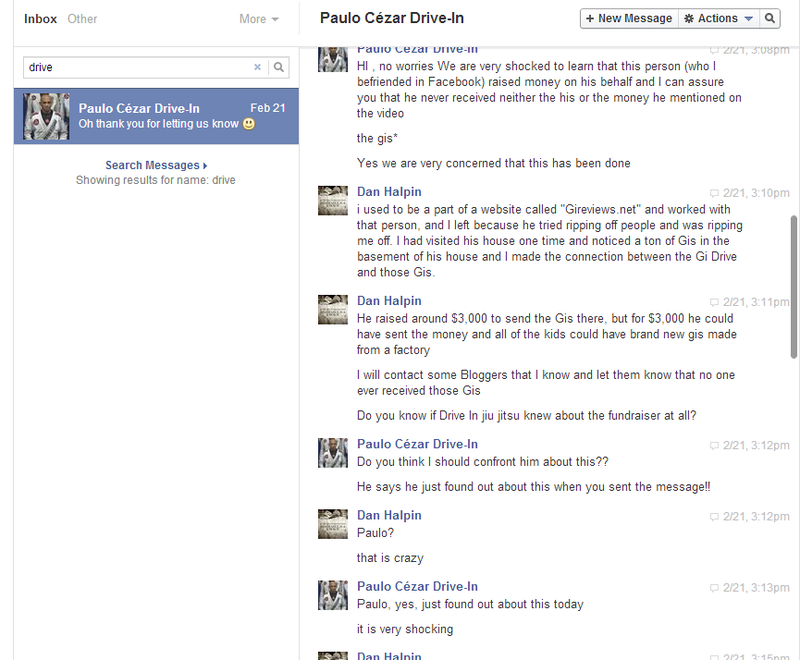 Edit: So after I contacted Paulo initially, he contacted Brendan and confronted him about the Gi Drive scandal. Brendan is now shipping Paulo some Gis (supposedly boxing them up tomorrow). I’ll update when I hear more. I guess Paulo talking to him was a nice motivator. I’m just glad a bunch of kids in Brazil are getting the Gis they need. (Hopefully anyway). When asked what Paulo’s sentiment was he said “Busted…now coming clean”. 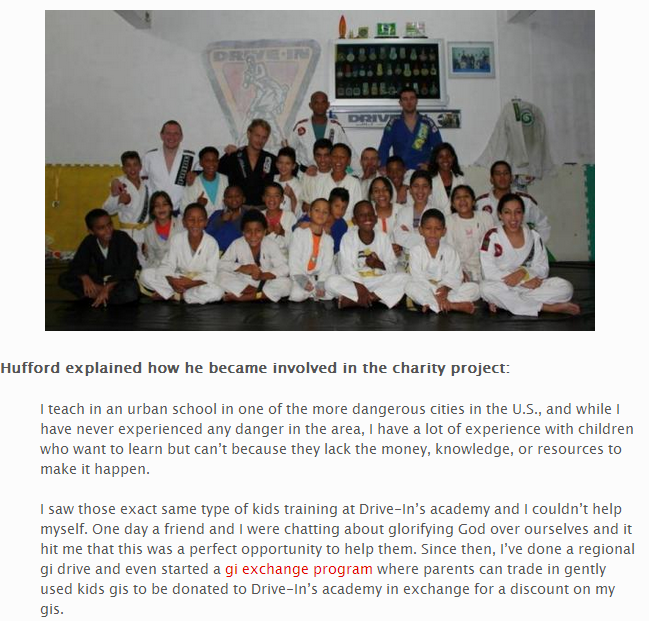 Edit: According to a screen shot provided by Brendan, Brendan actually messaged Paulo in August of 2013, 1.5 years after the Gi Drive ended, and told him his intention of bringing Gis to Brazil during a personal trip (Which makes me wonder if he was using the charity funds to get fly him down there…). 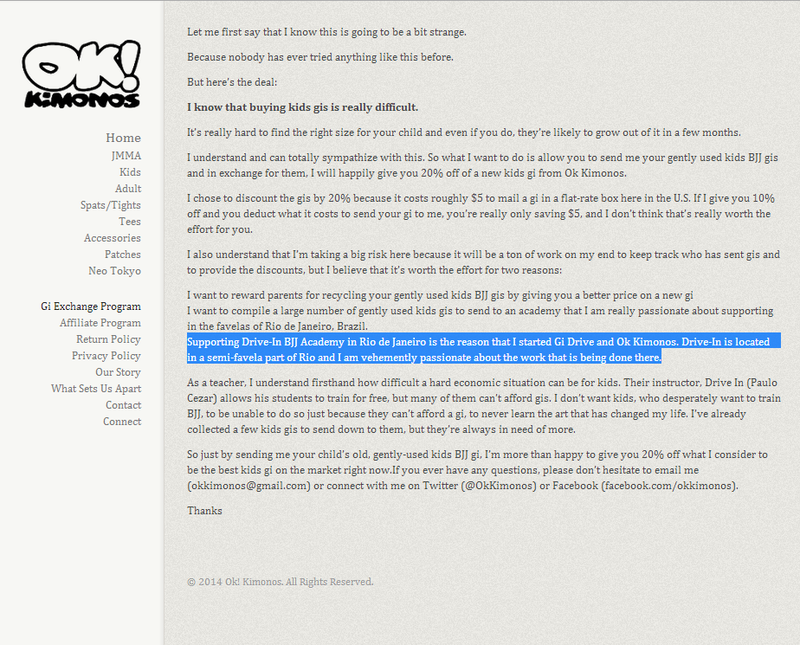 I am assuming Paulo simply gets a lot of traffic from people wanting to donate and that he forgot about Brendans post. Brendan never mentioned the Gi Drive, just that he collected used Gis and would be giving new ones. Which still leaves a ton of questions and still proves Drive In had no idea their name for the charity. For instance, Brendan admits that he had 100% control of the funds, but Nick Mitria (his original Gi Drive partner) ended up with all of the Gis. So what Gis are being sent to Rio? Did Brendan use the funds to make Ok! Kimonos gis to send to Rio, with the intention of claiming he donated them? Originally posted by Robert Kipness on the MMAunderground forum, he received a statement from Nick Mitria (from SubCulture, Brendans original partner for the Gi Drive). I asked Nick about this whole situation, if he sent the gi’s to CIA Paulista and his involvement in it. He responded back to me with this. This is the direct email I got from him, word for word. Take it for what you want. – “First, I want to say that it is not my job to drag anyone’s name through the mud, and I did not plan on getting involved in this discussion unless my name was brought up and my involvement came into question. My role was to run the facebook page and website, and get bodies to the Gi Drive Open Mat event, as I was tied into the Jiu Jitsu community and Brendan was a relatively unknown person. It was Brendan’s responsibility to handle all funds and the logistics of where the gis were going. After discovering the expense of shipping all of the gis collected to Brazil, an alternative option was required. At this point the gis were supposed to go to Cia Paulista for an outreach project for the youth in California. Very few of the gis collected were actually youth gis. I had my falling out with Brendan after a phone conversation I had with him regarding the funds, which he controlled. He suggested to me that we split the money that was raised for the charity and go our separate ways. I told him that was not our money for splitting, but he felt that he was owed a fee for running around and administrative work. I told him it was donated for a cause and it should be used for just that. I then made it very clear I no longer wanted anything to do with him, and that was the last time I spoke to Brendan Hufford over the phone.